Messaging service provider marks a decade of simple, clean, easy security solutions for the SMB community. We truly look forward to 10 more years of growing with the community. Over the past year we have asked, listened, and now are introducing more products that are relevant the SMB Reseller and End User. Spam Soap, a leader in email security, celebrates with its active community, the 10th anniversary of providing simple, clean, easy security solutions for the SMB community. Over the previous decade, Spam Soap has risen from a small start-up with an initial focus of adding a simple spam filter option for managed service clients, to an online powerhouse, and trusted friend to the SMB community. Over the last 10 years, Spam Soap has grown dramatically, from a single product to a comprehensive suite of security options. Developing cutting-edge solutions such as Email Encryption, Continuity, Archiving and more, the company has risen to approximately 20 employees and currently has relationships with some of the strongest and most trusted security companies in the world, such as McAfee. Since opening its doors in 2002, Spam Soap has remained strong throughout the many ups and downs within the economic climate. This can be attributed to two things: First, a singular customer service focus, namely helping companies find the simplest solution for their security needs, while making it easy to obtain the support they desire. Second, the company continually looks for ways to optimize and improve our products to keep pace with the ever-changing security threats popping up every day. “Over the past 10 years Spam Soap has enjoyed growing with the SMB Community and delivering both first-class products and high-touch customer support. We started with basic Spam filtering and have grown as the needs of the SMB community have grown, and now include a robust offering of Email Security products. A huge differentiator at Spam Soap is our CLEAN TEAM, the folks who pick up the phone and are always there to respond to technical questions,” said Leonard Dimiceli, Business Unit Manager, Spam Soap. In addition, to celebrate its 10-year milestone, Spam Soap is holding a special contest to say “thank you” to the channel community that has offered its support for the last 10 years. Known as the “10 YEARS, 10 DAYS, 10 TWEETS SWEEPSTAKES,” Spam Soap Twitter followers should look for the Daily Anniversary Tweet on @spamsoap between March 10th-March 19th. Simply retweet the daily tweet (#SS10YrAnniv) anytime between 10am-10pm (PST), and you will be entered into a daily drawing for prizes, which include an AppleTV, iPod Nano, and gift cards from iTunes and Amazon. Go to: http://www.spamsoap.com/10years for more information. Spam Soap (http://www.SpamSoap.com) is a premier messaging service provider. 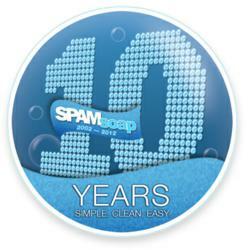 Founded in 2002, Spam Soap pioneered the use of the MX record email filtering model. Today, the company has helped thousands of customers worldwide wash their hands of the ever increasing messaging hazards that threaten their bottom line every day. With award winning technology, and one-of-a-kind personalized customer service, Spam Soap offers a range of highly sophisticated, and integrated hosted messaging services for all your email needs. Whether it's preserving business continuity, protecting confidential information, or ensuring regulatory compliance, Spam Soap provides clean, simple and easy solutions.